In a small bowl, add the sugar and orange zest. Rub the orange zest and sugar together with your fingers. Using an electric mixer, beat the butter and sugar and orange zest mixture together until light and fluffy, about two minutes. Beat in the egg, orange juice, and vanilla extract. 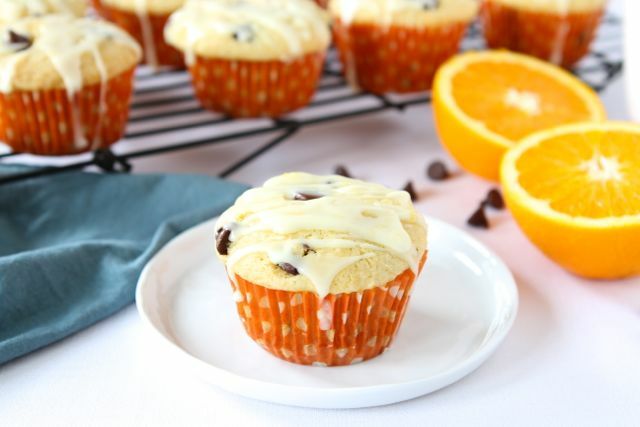 Using an ice cream scoop or large spoon, divide the batter evenly between the 12 muffin cups. Bake muffins for about 18-20 minutes, or until the tops are slightly golden brown. While the muffins are cooking, make the glaze. In a medium bowl, whisk together powdered sugar, orange zest, and orange juice. Let the muffins sit until glaze hardens. Oh my, these look too delicious! I have been off my diet to several weeks and desperately need to get back to it. So many temptations! I'll have to save it for another time. Wonderful recipe. My husband used to say that he always had an orange chocolate cake for his birthday when he was young. I had not ever seen a recipe for it.